Today’s early rally with prices trading at 2-week highs is being driven by dampened demand for risky assets as investors express concerns over a possible “hard Brexit” deal. This is driving them into safe-haven gold. In the U.S.traders will get the opportunity to react to the latest data on Core Durable Goods Orders, Producer Price Inflation and Construction Spending and to the latest communication from US policymakers concerning trade deal with China. Technical factors also played a role in the market’s strength with prices surging to a two-week high after breaching the psychological $1300 level. 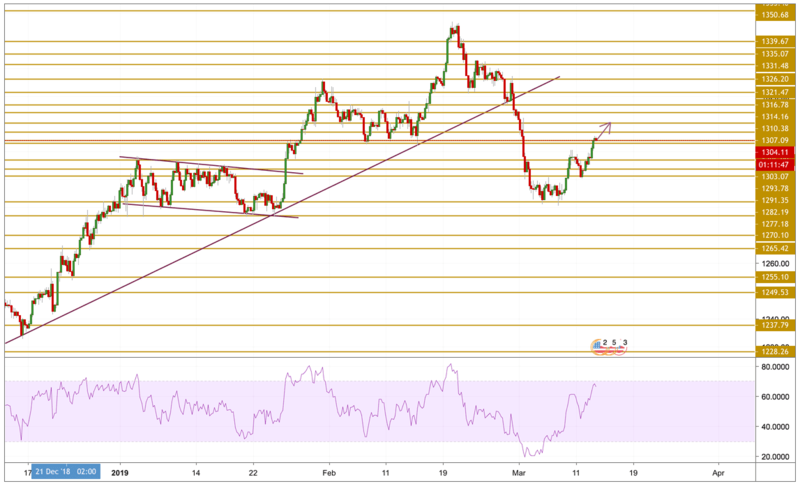 Gold is now trading above the $1300 level reaching almost the $1306 level with a bullish momentum as we can see on RSI and with more room to go before entering the overbought zone. The next level we will be focusing on is the $1310.38 resistance level.